On the final special-offer day of the pre-release discount order price of 20 dollars for the 2CD From Shadow to Shadow, please enjoy two more brief mp3 excerpts: an unexpected Fellow Travellers and a lovely, traditional-sounding Magdalene (My Regal Zonophone). When you order this excellent album, your twenty dollars go towards BtP's promotion of Procol Harum. Remind yourself of the Walpurgis Festivities on this website in days gone by: here, here, here, here, here, here, here, here, here, here, here, here, here, here, here, here, here, and here ... a good few minutes' reading! We learn that the Procol DVD will be delayed a month or so ... a June release is now foreseen. The delay will let Eagle get all the DVD navigation fully implemented: it's nothing to do with the music, liner-notes, etc. Luckily we have From Shadow to Shadow to feed our ears with great Procol Harum songwriting while we wait. On the second-last day of the pre-release discount order price of 20 dollars for the 40-song 2CD From Shadow to Shadow, please enjoy two more brief mp3 excerpts: a pair from the In Held suite, being 'Twas Teatime at the Circus and a contrasting Look to your Soul. With three more days left for pre-release discount ordering for the 2CD From Shadow to Shadow, please enjoy two more brief mp3 excerpts: another classic Brooker solo song, The Angler, and another excellent reading of Whisky Train, the only song heard twice on the album. When you order the album, your twenty dollars go towards BtP's promotion of Procol Harum. There's a new magazine asking for articles about songs, records, or artists who made their mark in the Sixties. They want articles between two and three hundred words long. "If you have been to a recent concert of a sixties artist and are able to write a short review, don't keep it to yourself – let others know. Maybe you have bought some recent music from a sixties artist – then tell us what you think of it." It may not be entirely helpful to perpetuate the idea that Procol Harum are 'Sixties artists' ... but most would probably agree that any publicity is better than no publicity. With four more days left for pre-release discount ordering for the 2CD From Shadow to Shadow, please enjoy two more brief mp3 excerpts: a cracking Latino Conquistador, and a delicate revision of Toujours l'Amour. BBC Radio 3's influential and highly-interesting Late Junction programme wants to know people's opinion about great drummers. Bill Bruford is DJ Fiona Talkington's (not unworthy) proposal at present. Please write (late.junction@bbc.co.uk) and tell her about a Procol drummer of your choice. Mention this poll! Do you listen to this new music / world music show? If not, why not! It's indirectly because of this show that we have the excellent Conquistador cover that you have just listened to on the link above. With five more days left for pre-release discount ordering for the 2CD From Shadow to Shadow, please enjoy two more brief mp3 excerpts: a Gary Brooker solo song in the form of the SS Blues, and another new Procol piece, The Emperor's New Clothes. When you order the album, your twenty dollars go towards BtP's promotion of Procol Harum. Added a considerable survey of the Old Testament of Procol Harum (thanks, Diane) ... anyone know for certain where it originally came from? See how you like another two great mp3 excerpts from the 2CD From Shadow to Shadow, which you can order now on pre-release discount: a really nice new angle on A Salty Dog, and a Matthew Fisher solo number, Cold Harbour Lane. All visitors note: you can pre-order the new Procol Harum DVD: Live at the Union Chapel from Amazon UK and Amazon Germany. A huge 25% off the UK price from Amazon ... buy two DVDs , and you get free postage too! By pre-ordering the DVD you help it get a head-start in sales, and you also help convince Amazon that the DVD is worthy of major promotion. Unfortunately you can at present order only the European version, from European outlets. BtP will of course let you know when you can order the US version. Updated the page about the Palers' Band, to reflect the release of From Shadow to Shadow. Listen to a brace of further great mp3 excerpts from the 2CD From Shadow to Shadow, which you can order now on pre-release discount (your twenty dollars go towards BtP's promotion of Procol Harum): a surprising choice in The Worm and the Tree, and an attractive Robe of Silk from 'The Well's on Fire'. How about another pair of great mp3 excerpts from the 2CD From Shadow to Shadow, which you can order now on pre-release discount: a note-perfect Wreck of the Hesperus, and a feelingly-played Juicy John Pink. Sample two more great mp3 excerpts from the 2CD From Shadow to Shadow, which you can order now on pre-release discount (your twenty dollars go towards BtP's promotion of Procol Harum): a reworking of the huge-selling 'B'-side, Lime Street Blues, and a Paramounts song co-written by Brooker and Trower, Don't Ya Like my Love? Updated the BtP shop to reflect the release of From Shadow to Shadow. Here are a couple of great mp3 excerpts from the 2CD From Shadow to Shadow, which you can order now on pre-release discount: two sometime-members of Robin Trower's band feature on a rocking Whisky Train, and there's a remarkable bluegrass So Far Behind as well. We announce the long-awaited and excellent new album from the Palers' Project, From Shadow to Shadow. Like its predecessor Lost in the Looking-Glass (which was highly praised by Brooker and Reid) the new album contains 40 tracks recorded in studios all over the world, in which great songs by Brooker, Fisher, Trower and Reid are imaginatively presented by musician-fans who love the material. The 2CD album will be shipping in May, so until May Day it can be yours at a special pre-release discount price of twenty US dollars. To order the album, visit this page; here you can pay securely online using either PayPal or your credit-card. To hear mp3 clips from each of the forty tracks, click on the links from the tracklisting-page. To know more about the artists, visit the biography page and click on the links there. 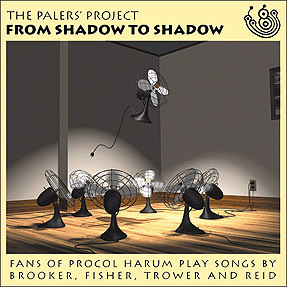 Note: all participants have contributed their music free, in order to support 'Beyond the Pale' in promoting the fame and music of Procol Harum (thanks, all). Your twenty dollars, when you order the album, will defray our up-front costs, then go directly into the continuing work of promoting Procol Harum as energetically and effectively as we can. BtP admires contributors who do their own translations, specially when neither language involved is their native tongue! Here's another page about the same gig, with some nice pictures. Remember the last time just these two appeared on television together with the same song in mind? Norwegian visitors note: the TV station NRK2 has still A Whiter Shade of Pale video in rotation in their SMS chat and music video jukebox programme Svisj. Nice to see Procol Harum featured alongside Britney Spears and Christina Aguilera and other contemporary musicians. You can vote for AWSoP (to get it played) by sending an SMS to 2008. The message should say: v 1855. Please vote and help our band get airplay. Did you ever send feedback about the possibility of a new Matthew Fisher solo album? You can now pre-order the new Procol Harum DVD: Live at the Union Chapel from Amazon UK and Amazon Germany. A huge 25% off the UK price from Amazon ... buy two DVDs , and you get free postage too! Do you recall the tour-programme that went with the above gig? Procol Harum live on Radio and Internet tonight ... a Danish concert! (thanks, Niels-Erik) You should also be able to receive this on sattelite, at least in the Nordic countries. Last call: your own footage is needed of Procol Harum at any gig up to 1970, maybe at festivals in Europe or America? Much of the footage fans have sent in has already found its way into Henry Scott-Irvine's Procol DVD documentary. Please let him know (henry@procolharum.com) if you have film of the band in their first incarnation. Time to catch up on all the German Rock Meets Classic concerts that have involved Procol music down the years. "PROCUL HARUM [sic] have undergone a line-up change, with the departure of bassist Alan Cartwright. Keyboards player Chris Copping now reverts to his original position of bass player, while new man Pete Sollie [sic] comes in on the keyboards." There were lots of Miller reviews in this issue of the New Musical Express … with Procol content. Thanks to everyone who took part in our signed AWSoP single competition. Yes indeed, the answer was 'April Fool' (we discounted the responses that spelt 'Fool' incorrectly or added an s on the end) as you will see on this page. The winner, drawn from the BtP Homburg (but not by a glamorous assistant on this occasion, chiz chiz) is Kerry Holloway: send us a 'real'-world address, Kerry, and the CD will be sent out to you by the BtP snails. Commiserations to people who assumed the whole thing was a hoax and didn't send in their answers. Added a page showing what Procol songs have featured most on Procol Harum compilation albums … this is prompted by, but does not include, the perfectly specious compilation we featured yesterday – which, despite its fatuousness and its give-away index-number – prompted quite a lot of poker-faced correspondence in which it was not always clear quite who was duping whom, nor whose tongue was in whose cheek; just the way we like it! Remember, everything at BtP is true, 364 days of the year, or 365 days in leap years.